Jo Nova analyses a new paper that shows the rate of global sea-level rise has slowed since 2004. The global mean sea level started decelerated rising since 2004. This paper discusses and graphs total sea level rise, steric sea level rise and the global mean ocean mass. 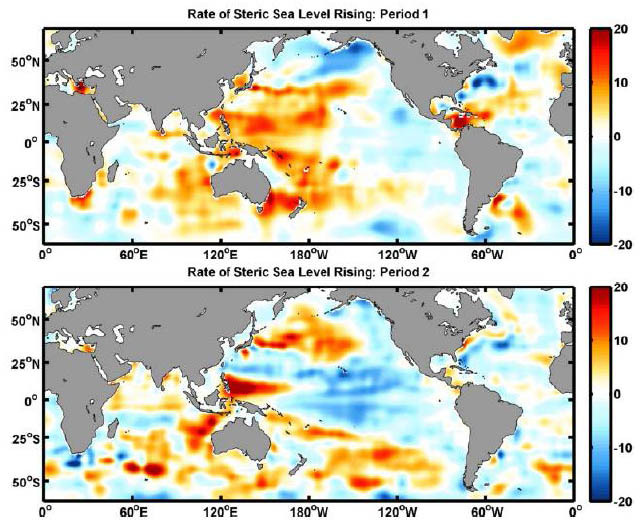 The Steric Sea Level is the part of the rise due to warming and salinity changes, so it best represents changes in ocean heat content. The total rise also includes water coming or going due to changes in glaciers, run-off, ice, evaporation and rain. GRACE data measures only the changes in gravity, which is caused by changes in water mass. Jason/Topex altimeter satellites measure the total sea-level changes and the steric component is calculated from the altimitry and GRACE data. I chose only the steric sea level graphs here, but the total sea level graphs and ocean mass graphs are also available in the paper. All this comes with the caveat that inasmuch as most experts accept that seas were rising by 3mm a year in the 1990′s, the raw satellite data showed next to nothing until it was adjusted. Hence the rate changes discussed in this paper could be an artefact of those adjustments. Sea levels might not have slowed their rate of rise, it may be that it was not rising very quickly in the first place, and is still not rising very fast. Either way, it doesn’t support the theory that pumping out CO2 makes much difference. That said, the change is most obvious in Figure 1b. cycle, the interannual variability, and the trend function (see text), are given as the colored lines in the panels from top to bottom, respectively. The ensemble mean of the IMFs on the different time scales during 1993-2010 are given as the thick black solid line in each panel. The colored bar in the third panel is the normalized Nino 3.4 index with arbitrary amplitude. The statistical confidence interval of the trend function is given by gray shadow in the bottom panel. The data is in units of cm. The intrinsic trend of the [Global Mean Sea Level] GMSL derived by EMD exhibits an accelerated rising period during 1993-2003 with mean rate 3.2±0.4 mm/yr and a decelerated rising period since 2004 with the rate about 1.8±0.9 mm/yr in 2012. The changes are apparent in figure 5b below — this is the average steric sea level rises before and after 2003. A large section of the central Pacific seems to have shifted from gaining heat before 2003 to losing heat in the last decade. Over the last 20 years the oceans have been gently expanding sometimes at faster rates and sometimes slower. Note this graph is the rate of the change in the rate… not a simple graph of the rate itself. steric sea level, i.e. the first-order time derivative of third IMFs shown in Figure 1. It appears something else is the main driver of climate, not CO². While Global Coal Consumption Jumps 70% Since 2000, Global Temperature Falls 0.03°C Since 2002!